A dramatic suicide attempt caught on video in Uganda's capital has spurred a national conversation about mental illness. In the footage, a young man jumps from the seventh floor of a downtown shopping complex as onlookers scream in horror. The man survived, but many are now calling for increased attention to the nation's mental health care system. 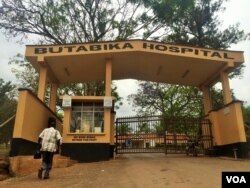 At Butabika, Uganda's only national referral mental health hospital, there are eight psychiatrists for 842 patients. Nearly always over capacity, the facility offers intensive psychiatric treatment free of charge. One former resident, who wished to remain anonymous, said the care and medication saved her life. Yet most Ugandans, especially in rural settings, lack basic access to effective care. With a population of over 37 million, there are only 32 psychiatrists in the entire country. Dr. David Basangwa, the executive director at Butabika Hospital, said that the government is improving access in Uganda. This includes refurbishing regional mental health care wards and training around 300 psychiatric clinical officers to work in lower-level health facilities. However, between stigma and lack of access, many with mental health problems end up self-medicating, Basangwa said. Effective treatment can also clash with cultural norms. Members of the country's small but growing atheist community report being told by their doctors that finding God could help them with depression. And for members of the LGBT community, fears that providers might divulge their sexual orientation to their parents stop many from seeking help. Dr. Seggane Musisi, a professor of psychiatry, said nobody should forgo treatment for fear of being stigmatized. Advocates say further initiatives by the government to recruit and incentivize a career in psychiatry are needed. They stress, however, that addressing social factors that spur mental illness, such as the high rates of unemployment, sexual violence and war-induced trauma, must go hand-in-hand with improving the health of all Ugandans.